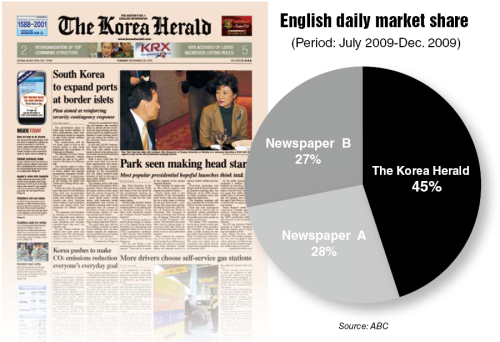 The Korea Herald has the largest newspaper circulation and online traffic among English-language dailies published in South Korea. Figures released on Nov. 24 by the Korean unit of Audit Bureau of Circulations revealed that The Korea Herald is the top English national daily here, outsmarting its rivals by a wide margin. The ABC report was based on the data of average daily circulation of daily newspapers from July to December in 2009. According to ABC, The Korea Herald topped the English daily ranking with 35,500 copies per day, followed by the Korea Times with 22,000 copies and Korea Joongang Daily with 21,200 copies. In line with its offline circulation, The Korea Herald’s renovated online edition also showed positive performance. Since its revamp in April, The Korea Herald website has led the English-language online newspaper category in South Korea. The renovation involved a full redesign of the website, adopting a new look and introducing new sections and features geared toward today’s tech-savvy Internet users. Social network functions such as sending an article to Twitter and Facebook were also introduced. Figures released by Logger, an online traffic tracking firm, show that there is a steady increase in the number of visitors and page views for The Korea Herald website since the renovation. In April, the total traffic was about 680,000 visitors, but the figure shot to nearly 16 million visitors in September before slowing to 14 million visitors in November. Page view figures also rose accordingly. In November, the total number of page views by visitors topped 18 million, also outpacing its rivals in the English-language newspaper category in major tracking sites. The steadily increasing Web traffic is partly bolstered by Naver’s newscast service. Naver, the country’s biggest portal, runs a massive news section, and a selection of The Korea Herald articles are displayed on the main page of Naver.com, boosting the paper’s exposure to mainstream Internet users. The most popular article on The Korea Herald website is “Dancing toddler hits Youtube,” which was published in September and attracted more than 600,000 hits. Trailing behind are “Gut buster burger shocks netizens” (about 500,000 hits) and “NASA to hold news conference on alien life” (about 460,000 hits). According to Rankey.com, an Internet market consultancy, The Korea Herald is the only English online paper to have made it into the top 100 websites in South Korea. The Korea Herald currently has approximately 700,000 to 800,000 visitors per day.